You may have heard about progressive die stamping before, it’s a method of manipulating metal into shapes that progressively form into the specified parts used by major industries—namely automotive, industrial, electronic, and housing. This process is spread across multiple stages within the assembly line, arriving at each individual work station to be formed in a specialized manner, before for finally being cut out from the surrounding excess material. The most obvious benefit to using this process is the rate at which metal parts can be stamped out. It is an efficient and quick line of creation, without the interruptions that are common with many other forms of metal fabricating or custom machining. Any company that needs their metal parts in a hurry will use progressive die metal stamping. Because the process is so efficient, less excess metal is left at the end of the creation process. The methods of forming metal are all every intuitive; bending, stamping, coining, and crimping all allow for uninterrupted formation without cutting away too much. This savings is obviously passed down to the client. If you compare progressive die metal stamping, you’ll find that the process is overall quicker to get started. This is because the individual steps required in older fabrications are often reduced to one seamless assembly. Less steps makes for a much more accessible operation for clients and increase the material efficiency for their parts greatly. A real draw for many seeking manufacturers is the power of what progressive stamping can accomplish in-terms of geometric shapes on a single step. Going back to the previous point of streamlining processes, a single metal die stamping operation can produce a complex form, allowing for more detailed designs without paying a premium. Because the system is so efficient, manufacturers are able to run longer sheets and produce more parts per line, thereby increasing the volume of parts produced per day. Progressive die metal stamping is perfect for manufacturing needs both big and small. Also, because of the nature of hard tooling dies, there will be no concerns over die degradation, leading to less errors and defects than traditional fabrication methods. 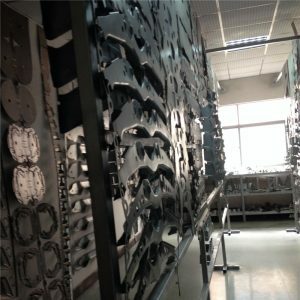 KKtooldie tool and die company has specialized in progressive die,stamping parts for over 10 years. contact us today to find out what we can do for you!